Fill the fawn’s dish full of berries! Put the pretty bow on the fawn! 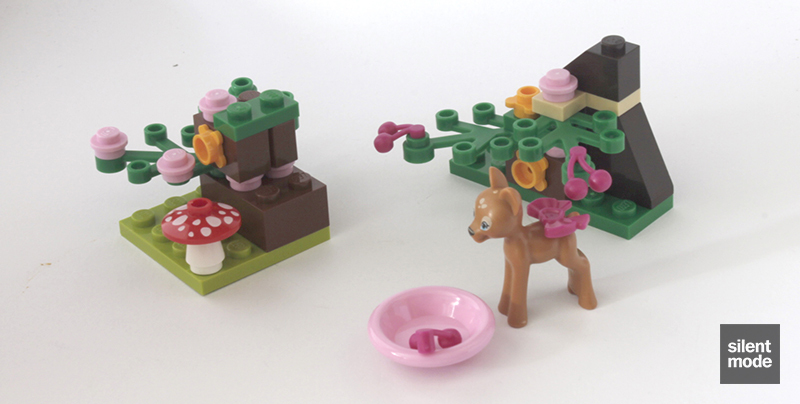 Take care of the fawn online or find more building inspiration at LEGO.com/friends! 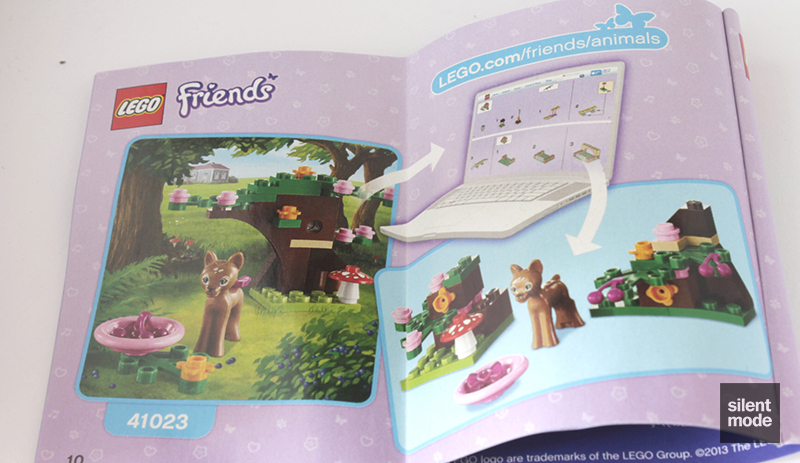 Combine with LEGO® Friends sets 41024 and 41025 to create a bigger habitat or playground for all 3 animals! It’s time for the second of our Friends animals Series 3 reviews, and this time it’s the turn of a tasty piece of venison… I mean, the fawn. Immediately noticeable on the front of the packaging is the deer’s oversized head. Look at it, acting like it owns the place. 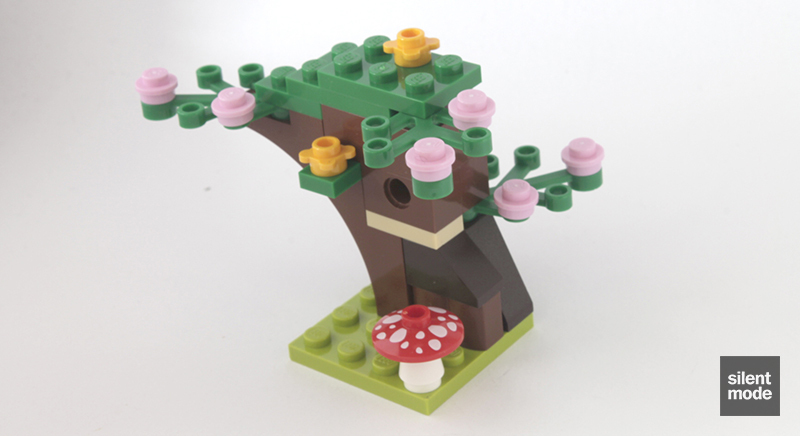 The colour scheme of the parts seems reminiscent of Squirrel’s Tree House (41017). As for the mishap with curly quotes on the barcode… they do again! As with Puppy’s Playhouse (41025), the tearproof packaging contains a neatly packed bag of parts and a crisp instruction book. This time we’re greeted with some Dark Brown slopes, some incredibly useful Green plant pieces, and the lowest priced opportunity to get hold of a printed toadstool cap if you don’t have one. Amazingly there’s only one White cone in the set. 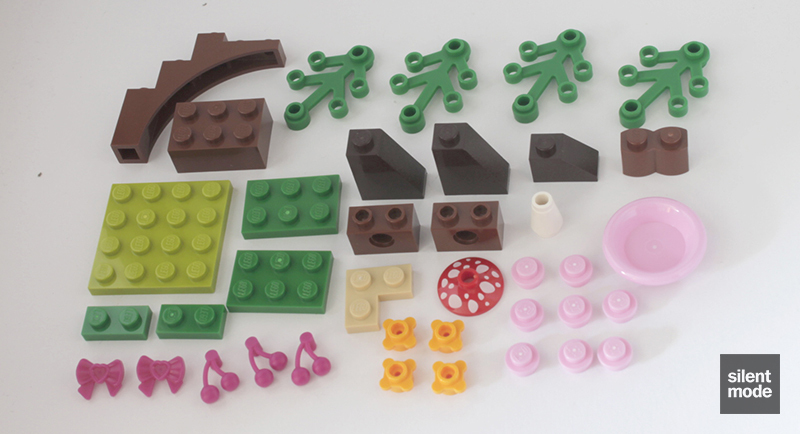 There are no exclusive parts in this set, but the Magenta cherries are shared with Downtown Bakery (41006) and is another variant introduced by the fourth wave of Friends. And so here we have the fawn: the only unique animal introduced in this series. The fawn has similarly long legs to Olivia’s Newborn Foal (41003), but here I think they’re far more suited. It looks like a gracious animal, and the printing on the head is better than the animal looks on the packaging. This fawn is of course female, as indicated by the above description and the Magenta bow. But again, someone saw fit to place a spot for an accessory on its… above tail area. I suppose it’s meant to represent tying a bow on its tail, which would naturally be very tricky with a moulded animal. This uppity fawn is always served a selection of wild berries, but refuses to eat them unless they’re served on nature’s equivalent of a silver platter. I’m pretty sure we’ve seen this building technique before, but the first (and really only) thing we do in this set is begin building a small tree. The Dark Brown slopes and the Reddish Brown arch serve as the trunk, while we also place the single White cone on the patch of grass. We build the rest of the tree from the Green plates and Brown Technic bricks, as well as some of the plant pieces. The Bright Pink round plates and Bright Orange flower plates serve as blossoms. The head of the toadstool is also placed on top of the White cone. The remaining pieces go on top of the tree. Well that really didn’t take very long, did it? It was a longer and more complex process than Puppy’s Playhouse, due to the way the tree was constructed. 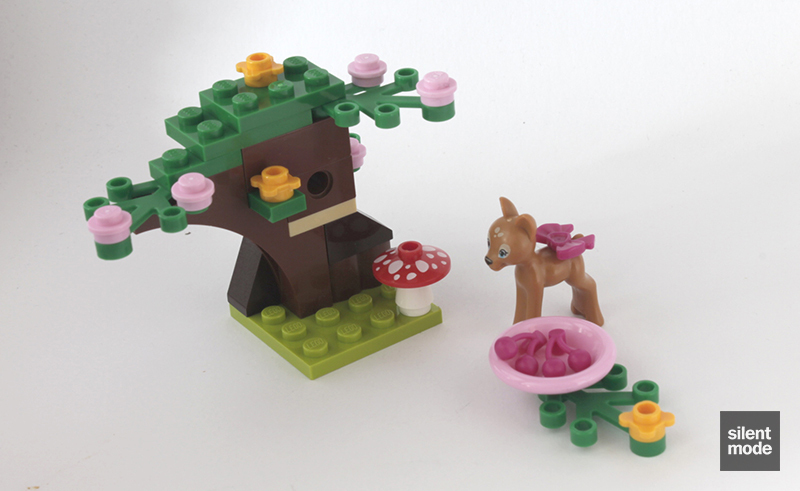 However, we have a very small but convincing forest scene, where the fawn is left to its own devices. Though none of these parts are unique, they are potentially very useful. This build was trickier to do without the instructions, made more difficult by having to take the original model apart – but a replica is possible. Here we have a forest scene devoid of trees but still with plenty of plant life. 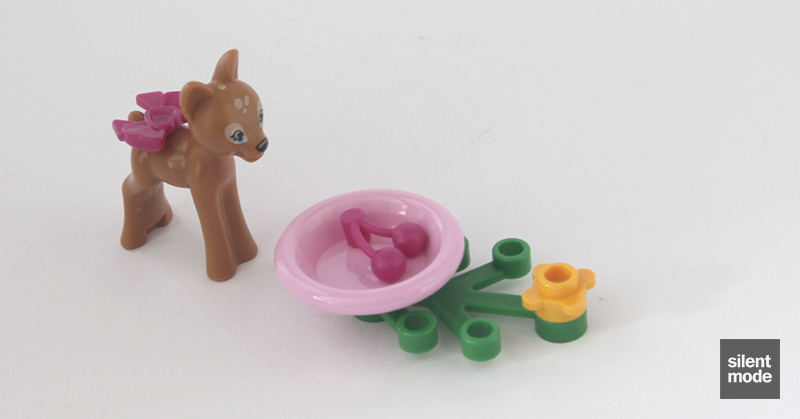 First of all, it goes without saying that this set is a must-buy for the fawn. Along with the bird from Olivia’s Tree House, the squirrel from Squirrel’s Tree House and Oscar the Hedgehog (or the Series 2 equivalent), this is one of the best animals the theme has to offer. You may even feel compelled to buy more than one set for an army of fawns, or for a larger forest scene. Unfortunately I think this set will be the first to disappear from the shelves. As it stands I think the set has a very good selection of parts, and three or four fawns in your arsenal would be understandable. It’s up with Squirrel’s Tree House as being the strongest in the series, as well as good value for money. 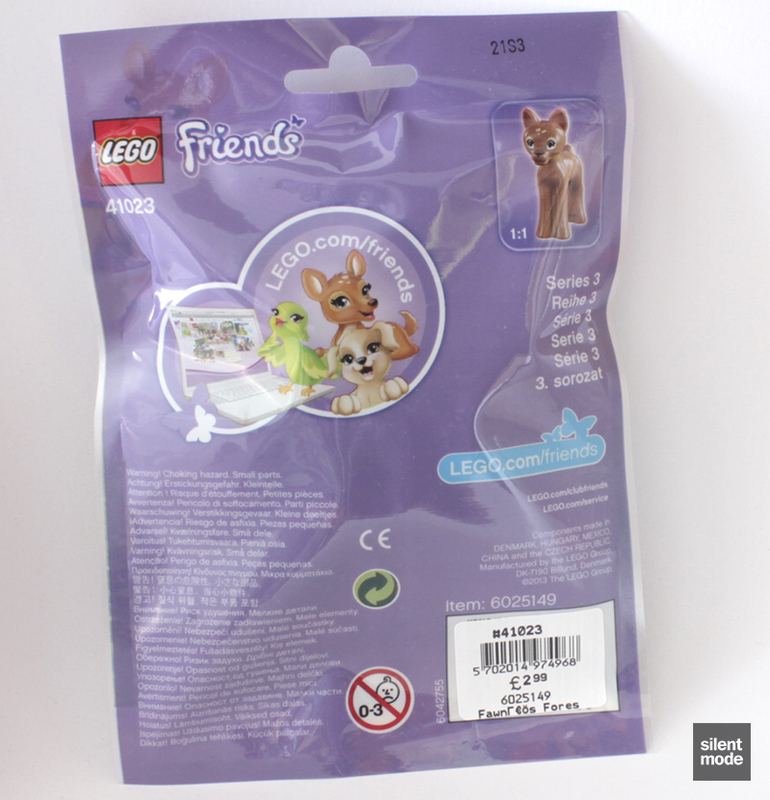 I like the design of the foal, and the set is definitely suited to a polybag (or in this case, a Friends animal collectible bag). If anything it could have been a bigger set at a higher price point. The tree is the most complex thing you'll build in this series. The alternate build is a bit of a reach but is still okay. Nothing incredibly special in this set besides the fawn, but what there is will be useful for MOCs. A great opportunity to obtain toadstool caps and plant pieces. Even less to do with this set than Puppy's Playhouse: it's more of something to collect multiples of to build a scene with. The set I'd probably recommend getting hold of first, and a no-brainer when discounted. Expect the fawn to be sold out first. On the whole I’d give the fawn a respectable 7.0/10: not quite at the Approval stage but worth having, I think. One more animal to go, so see you in a bit.